Our machinery park was equipped with the welding positioner BY – a universal auxiliary device used in simple and partially automated technological processes. It is particularly useful for welding of cylindrical elements, such as pipes, tanks, etc. 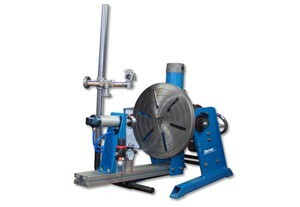 It allows for secure, precise and fast welding in the optimum position. Welding positioner disc can be tilted from 0 to 90 degrees. It is equipped with mounting channels, where you can install jaws and handles. The device can choose the direction of the rotation of the welding positioner disc and adjust the rotational speed. It is equipped with the control pedal (start-stop) for controlling the work.